for an audacious, timely, inspiring evening at Books are Magic! And thanks to everyone who came out to share the evening. 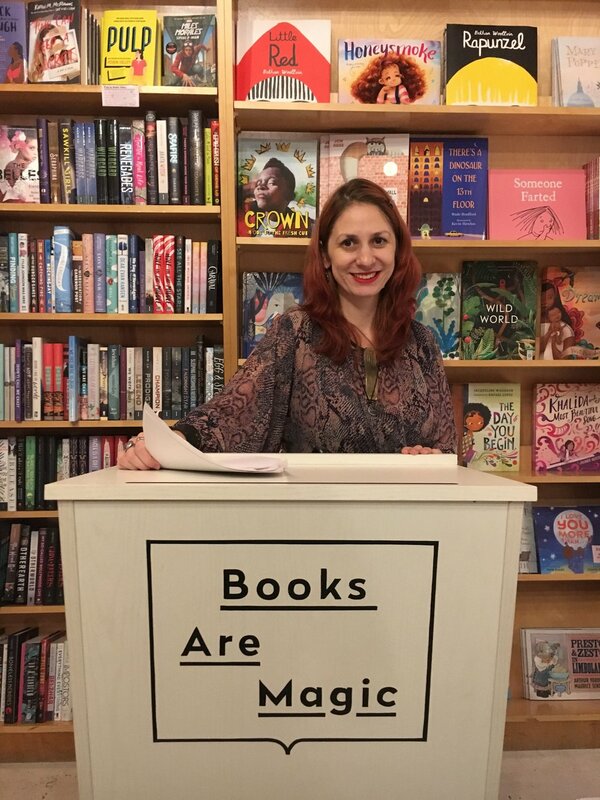 Monday, January 8th at 7pm at Books Are Magic! Benjamin Gantcher’s first book of poems, Snow Farmer (CW Books, 2017), was a finalist in several book contests. His work has appeared in national and international journals including Tin House, Slate, Guernica and the Brooklyn Rail. His chapbook Strings of Math and Custom was published by Beard of Bees Press, and his first poetry manuscript, If a Lettuce, earned finalist honors in the National Poetry Series and Bright Hill Press contests. A recipient of a LABA fellowship as well as residencies from the UCross Foundation and the Omi International Arts Center, Gantcher is a Pushcart Prize nominee and a former poetry editor of failbetter. He teaches math and English at Saint Ann’s School in Brooklyn, where he lives with his family. Natalya Sukhonos is bilingual in Russian and English and also speaks Spanish, French, and Portuguese. Natalya has a PhD in Comparative Literature from Harvard University. She teaches Spanish at Ramaz School, and works as a consultant for Writing Curriculum at Minerva Schools, CGI. Her poems are published by the Saint Ann's Review, Driftwood Press, Middle Gray Magazine, the Really System and other journals. Natalya was nominated for the Pushcart Prize in 2015 and the Best New Poets Anthology of 2015. Asiya Wadud writes about borders, limits, and the variegated truth. She teaches third grade in the daytime and English to new immigrants and refugees in the evening. Her first book, Crosslight for Youngbird, was published in September 2018 and she has other books forthcoming in 2019 and 2020 from Ugly Duckling Presse and Nightboat. She lives in Brooklyn, New York, where she loves animals. THE NEW ISSUE OF TSAR IS HERE, FEATURING ART BY BIANCA STONE, Jarrett Key, MArcus leslie, Poetry by MRB chelko, asiya Wadud, Cheryl Moskowitz, Fiction by JW McCormack, Susan Eve Haar, lunda rui feng, translation by Fayre makeig, marcela sulak, and much more! Check out CONTRIBUTOR ASIYA WADUD’S NEW BOOK, CROSSLIGHT FOR YOUNGBIRD, JUST OUT!